The church with the full Italian name "Basilica di Santa Maria Gloriosa dei Frari" is a large and famous Gothic church in Venice. The Basilica is not too far away from the Santa Lucia train station and is about 15 minutes walk away. 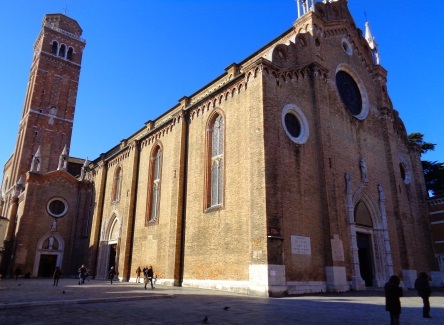 The church of Frari is famous for its famous paintings and sculptures. In the church there are also graves of some Doge's of the former Republic of Venice. A Doge was a head of state. The word "Frari" in the Venetian language means "brothers" (Italian fratelli). So the church could also be called the "Church of the Brothers" in German. Some of the many works of art in the Frari Church in Venice are well known. These include two paintings by the world-famous painter Titian from the beginning of the 16th century. They are the gigantic painting "Assumption" (size almost 25 m², also called Assunta) and the altarpiece "Madonna of the house Pesaro". Also the grave of the artist Titian (full name: Tiziano Vecellio) is worth seeing in Frari Basilica. The graves of some important Doge's (heads of state of the Republic of Venice) are in the Frari Basilica as well. Not far from the Frari church is another important sight in Venice. It is the Scuola Grande di San Rocco. To the entrance of the city of Venice, the main station Santa Lucia, you walk about 15 minutes. In front of Santa Lucia railway station, cross the big bridge "Ponte degli Scalzi". After about 10 minutes you will reach the church. Opening hours 2019: The Frari Church is open daily from 9 a.m. to 6 p.m. for visitors. Of course it is not possible to enter the church when there is a church service or another event. In general, it is therefore better not to visit churches in Venice on Sundays or public holidays. If you want to come on Sunday, come better in the afternoon. Entrance fee 2019: The Basilica Frari is one of the few churches in Venice that costs admission. As far as we know, adults pay 3 Euros if they do not have a Chorus Pass (see yellow box below). The figures refer to the beginning of 2019. Instructions: After you have started the movie, you can rotate the picture with the mouse.